So here I’m beginning a new blog series on the first project for the class, the sleeveless sheath dress. Careful readers will note that project isn’t the same as the title of this article, so some explanation is in order. Internal seaming. These are seams that don’t form the structure of the garment, but exist for style purposes. The garment has to have some sort of internal seaming involving curves, angles, or two seams that meet at a point. For the men in the class, our instructor realizes we may not be excited about sewing a sheath dress for ourselves, so has allowed us to propose our own alternative garment, as long as it meets the class requirements listed above. I do have a sheath dress pattern lying around, from a Craftsy class I purchased, so I already had Plan B. What was missing was Plan A – the project I really wanted to make. Menswear, being much more constrained by convention, typically doesn’t use a lot of the style options in women’s clothing. Linings are sparse outside of jackets, and invisible zippers are rarely used. I went through several ideas with a pencil and sketchbook – shirts, shirt-jackets, and even a vest or two. None of them looked very appealing. 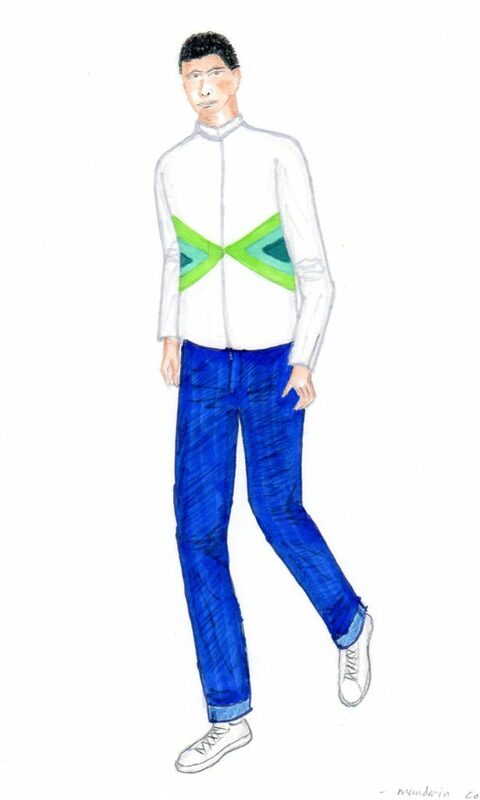 But eventually, I hit upon an idea for a jacket that I liked – a colorblocked jacket featuring internal seaming as the main design element. I made a fashion illustration to communicate the concept to my instructor, who approved. Colorblocked stripes, front and back. The stripes meet at angles in the front, meeting the requirement for internal seaming. They also meet the requirement for three design elements in the finished garment. On-seam front pockets. The jacket has front pockets, with the opening right at the seam between the lowest stripe and the jacket body. Zip on center front for closure. Inside Front Facing to facilitate an inside lining. Inside Back Yoke for a back facing, again to facilitate the lining. Zip placket on outside sleeve, at the cuff. This is done with an invisible zipper, to meet the requirements. Gusset at the cuff, behind the zipper, in an accent color (not shown in illustration). Inside Lining to meet the requirements. A band collar (Mandarin/Nehru style) – think Members Only jacket from the ’80s. Sleeve and waistline hems – I’m not aiming to do anything fancy here. Together, the design features meet the requirements of the assignment, and in a few cases (the on-seam pocket and sleeve gusset) go beyond what the assignment asks for. The more I thought about the project, the more I leaned to the darker palette. There was also the thought of what fabrics would work the best. My initial thought was something synthetic, like nylon, perhaps with ripstop for the lining. Another choice was cotton poplin for the outside fabric, and something slippery (like rayon or polyester) for the lining. My instructor suggested linen as a possible choice, for something a little dressier. With those colors and fabric ideas in mind, I went on a field trip to Joann’s with some sewing friends from the Sips n Sews studio. I normally don’t like shopping Joann’s for apparel fabrics, but in this case I thought they might be good because they often carry the same fabric, in multiple colorways – just what I need for this project. 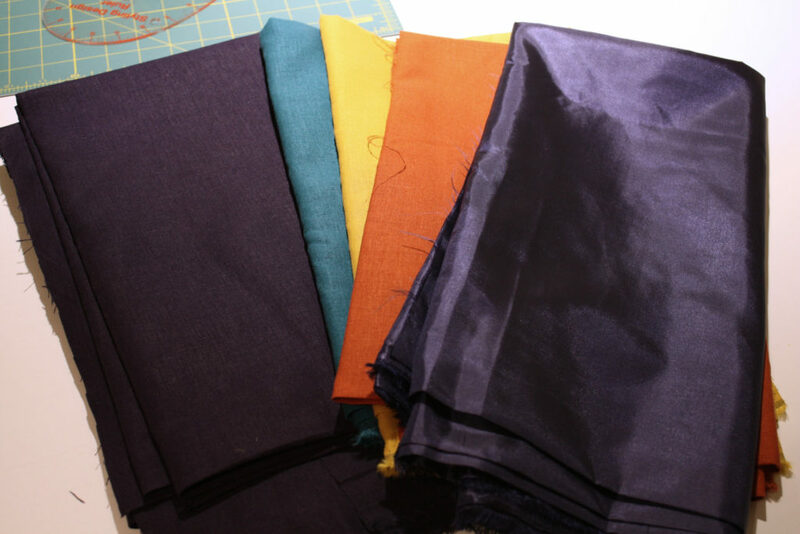 And Joann’s did come through for me, with this set of linen-rayon blends for the outer shell, and some dark blue polyester satin for the lining. This is a slightly different color palette than I had in mind – the dark purple from my original dark palette concept is replaced with a mustard yellow. But this palette also works, and I like it. Here’s another illustration showing the back of the jacket with my chosen palette. This isn’t my best illustration ever, but it gets the idea across. Part of the assignment is to prepare a written workplan outlining how we intend to create the garment, and the order of operations for assembly. We are allowed to start with a commercial pattern as a base, and modify it to add the required style elements. For this project I will be drafting a pattern from scratch, using the personal sloper I made in Moulage class last summer. Before starting the garment proper, it might be a good idea to do some samples to make sure my pattern draft is correct and the garment can be constructed. Currently I’m in the middle of fitting and patternmaking. I hope to tell you more about that soon. You and “someone else*” shop at a Stepford JoAnn’s. Love the jacket concept – it harkens a bit to a time when youth included me in the description. Glad you continue to pursue your education. It’s a joy to “ride along” (never mind hang my head out the window and holler back, as it were). Looking forward to the travelogue, line drawings, diagrams, and free-wheeling narrations you are known to spew. *don’t make me say it, you know precisely of whom is indicated by the asterisk. Does your jacket pattern include welt pockets? I hope you choose linen, and welt pockets. They will turn out really well( if you cut the welt and remember the “triangle” I didn’t) I will love to see it. I may follow along perhaps i will stop daydreaming. And get the welt pocket right this time. Joann’s ! 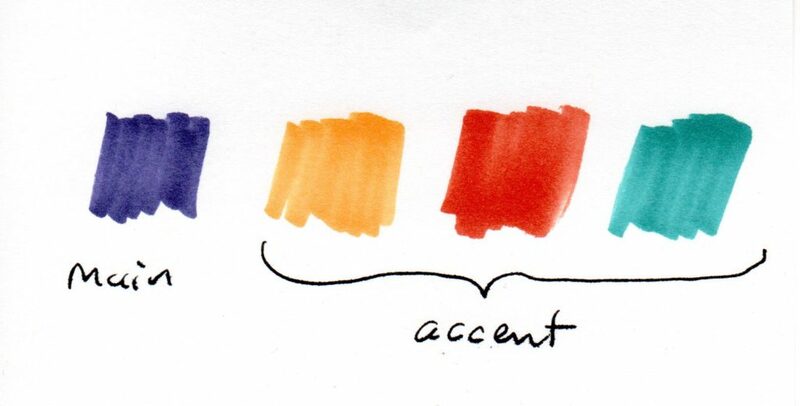 Who knew… Yes, variety of colors is one of the reasons I shop there. Also, if I want something different, the store will get it for me. I hadn’t intended to include welt pockets – instead, I planned to include an on-seam pocket as you would see on the side seam of a pair of trousers. I’ve never worked with linen or linen-like fabrics before, so I’m looking forward to the opportunity to use these linen-rayon blend fabrics. This is quite ambitious! My experience with a linen-rayon blend fabric was a bit frustrating as the fabric wants to flow rather than stay put. I think generous application of starch will serve you well in the cutting and sewing phase. I look forward to your progress! Yes, the whole fitting and patternmaking exercise goes beyond the bounds of the assignment, which is really about the construction. Still, I didn’t want to make a shift dress, and the idea of creating an original garment starting from scratch sounded appealing. When inserting invisible zippers, you would normally sew them in a seam. Do you plan to insert an invisible zip in a sleeve seam? And you might consider inserting an invisible zipper as the closure on your front pocket. It would work since you already have a seam in that location. If you choose to use the cotton/linen fabric, use a light weight interfacing liberally to tame the sometimes too fluid nature of the fabric. I like using a knit fusible interfacing since it adds just enough stiffness for precise stitching without adding too much bulk. And don’t forget to interface anytime you insert zippers, especially when sewing in those invisible ones. You are very right – I will need a seam in the sleeve in order to install the invisible zip. A classmate pointed this out to me and then it became obvious. Currently I am still fitting the jacket and sleeve, with guidance from the instructor. She is also helping me to convert the single-piece sleeve draft into a two-piece sleeve. Also, thanks for the advice on the interfacing – it makes sense. The instructor showed us where interfacing should be applied on the sheath dress in class, but I have to apply my own judgment for the jacket.